Journeys Inspired by the Life of Jane Goodall. When twenty-year-old Annie leaves her privileged life in suburban New York to set up a leather clothing factory in Ethiopia, she anticipates glorious savannas, magnificent animals, and colorful tribesmen. Her treasured childhood Africa scrapbook never prepared her for the isolated, barren mountains of northern Ethiopia, relentless poverty, and a ten-year drought and famine unacknowledged by the world. 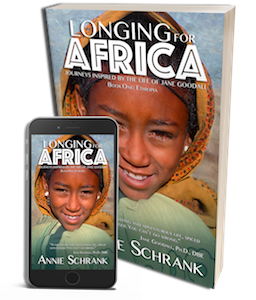 Housed in a primitive mud hut with no electricity or indoor plumbing, falling in love with a handsome Italian, and forced to flee the military coup that toppled Haile Selassie, will Annie find the Africa of her childhood dreams or will she return home, disillusioned? Annie worked for thirty-five years as a clothing designer in Los Angeles while living in Malibu, California. Throughout, she wrote occasional freelance magazine articles with accompanying photographs, allowing her curiosity to take her from subjects as diverse as revered explorer interviews, adventure travel all over the world, to the art of baby massage. Currently she lives in Celebration, Florida, with her partner, Grover, and works as a costume photographer and digital archivist for Disney World.